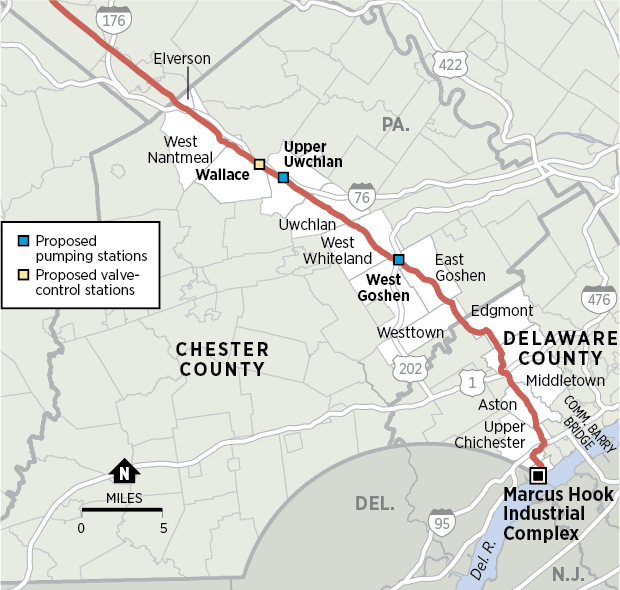 The Mariner East 2 is a pipeline slated to travel east from Washington County along the Ohio border into Delaware County in Southeastern PA, through 17 counties. The company building it is Sunoco Logistics. We’ve known the Mariner East pipeline construction has devastated our countryside; contaminated Pennsylvania’s water and land, and worsened our climate. If allowed to complete, this project would put many more families at risk of leaks and explosions. 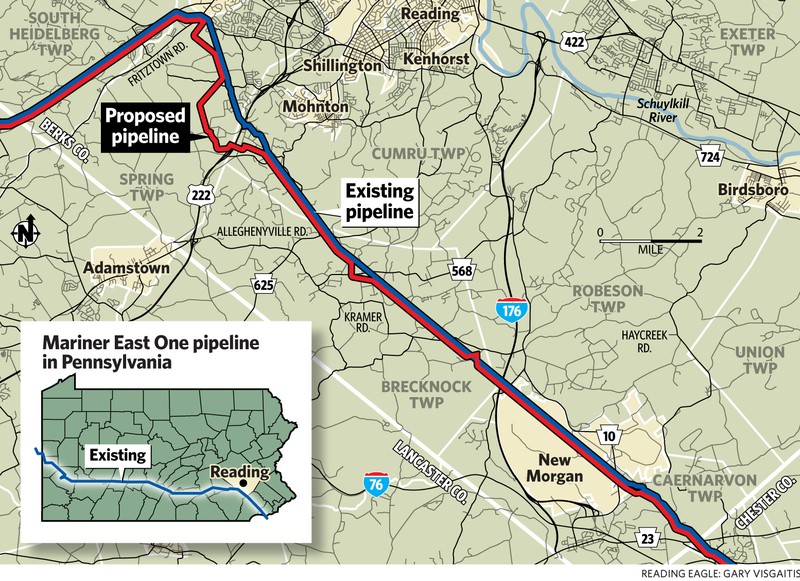 If you’re new to this issue, a suggested reading is this post by Bernie Greenberg: What went wrong with the Mariner East 2 pipeline project? This project has been halted recently, see: PUC Judge Shuts Down Sunoco Mariner East Pipeline (Again) Amid “Grave Risk”. Over 17 groups are organizing a rally on Saturday June 9th in West Chester. Because we need to #StopETP from completing this pipeline. Which groups? 350.org, 350 Philadelphia, Clean Air Council, Del-Chesco United for Pipeline Safety, Delco PA Indivisible, EarthWorks, Food & Water Watch PA, Goshen United for Public Safety, Keystone Progress, Lancaster Against Pipelines, Lebanon Pipeline Awareness, Middletown Coalition for Community Safety, PA Interfaith Power & Light, Philadelphia Physicians for Social Responsibility, Uwchlan Safety Coalition, Way Forward, West Whiteland Residents for Pipeline Safety and more. DEP found deficiencies in company’s application forcing it to resubmit documents and delaying construction. Deficiencies include a lack of storm water management; plans for pump stations; unidentified exceptional wetlands; lack of construction detail for water crossings; no mention of nearby drinking water wells, and more. Eminent Domain – In July, 2016 the PA state appeals court ruled that since Sunoco a public utility, it can use eminent domain to gain access to private property, even homes and farmland. 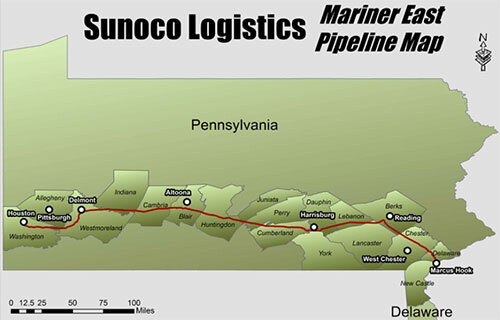 And Sunoco boasts about it here: “Sunoco argues that their use of eminent domain is justified because Mariner East II will provide a public benefit by providing extra propane to residents in offload points throughout the state.” (8/31/16. DeSmog Blog). Minimum of 47 mainline valve stations and 18 pumping stations required. Some require new land disturbances. Would cross 581 wetlands, 1,227 streams. How many farming & tourism jobs lost when the pipeline is built? Any other businesses hurt? This pipeline has generated an unprecedented 29,000 public comments to DEP, most against it’s construction. The Sierra Club has sent out action alerts and are working with local groups in Chester County. The Delaware Riverkeeper Network filed a petition to intervene in 2014; have taken other legal actions; have testified against this pipeline at DRBC hearing on 10 Nov 2015; have sent action alerts to their members; organized “FERC Doesn’t Work” event at National Press Club. 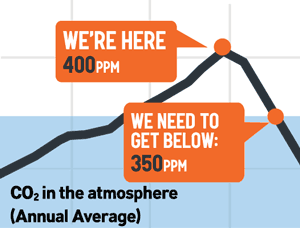 The Clean Air Council has legally fought Sunoco’s status as public utility; in 2014 sponsored Chester County Community Coalition; in 2016 developed a public website, see cleanair.org/dirty-energy/pipelines. Grassroots group Resist Sunoco PA supporting efforts in several counties. Sunoco Logistics has acquired rights of way on more than 2,600 tracts, the vast majority of those being negotiated easements that did not involve any court action. Huntingdon County – In March 2016, the Gerhart family of Huntingdon County tried direct action to stop Sunoco Logistics from cutting trees on their land; this is before permits were even obtained for pipeline construction. The court costs were supported by Energy Justice Network. The family is working with Juniata Watershed’s People Before Pipelines and has set up Camp White Pine for supporters. Lancaster County – Affects 6.5 miles in northern Lancaster County. Berks County – Impacts 221 acres, per this. Chester County – Affects 23.6 miles with impacts on 184 acres. Delaware County – Affects 11.4 miles with impacts on 83 acres. Delaware County municipalities Middletown, Swarthmore, Thornbury, Westtown, Rose Valley and the Rose Tree Media School District have all passed resolutions expressing grave concern about plans for this pipeline. Media Borough Council sent a letter of support for the proclamation adopted by their neighbors in Middletown. (12/19/16, DelCoTimes) (www.eastbootroad.com)The most active group seems to be the Middletown Coalition for Community Safety (MCCS).Patricia Yevins (and 3 neighbors) whose 50-acre farm near West Middletown will be bisected by the pipeline after she lost her eminent-domain case. Sunoco demanded the right to come back within three years and build an adjoining pipeline without additional compensation. Awaiting a decision by a mediator to determine how much compensation Sunoco must pay to cross their land, though the company has already cleared the rights of way and dug the trench.